Alice Mary Love is having a normal, everyday workout at the gym – when she falls and bangs her head. In a second, 10 years of her memory is wiped out. The last thing Alice remembers is being pregnant, expecting her first child – affectionally dubbed ‘the Sultana’ by her and her husband, Nick. But when she wakes up, Alice finds herself in a completely new life – she has three beautiful children she doesn’t remember, her mother has remarried – her husband’s father – and her sister seems oddly distant. None of these facts are as disconcerting as the fact that Alice’s beloved Nick seems to despise her. Post-accident Alice cannot understand her new life; her former slovenly self seems to have turned into a super-fit, glamorous style maven who’s constantly running around, holding charity bakes and hosting PTA meetings. She doesn’t realise how her life has ended up this way – and, more scarily, she has no recollection her of her three children. Olivia, Tom and Madison are all wonderful but have very different, strong personalities – and Alice doesn’t remember their favourite meals, how to deal with them, or even what they’re like. Added to the mix is the appearance of Alice’s new ‘boyfriend’ – Dominick. Her and Nick have apparently been discussing the subtleties of divorce and custody settlements, but old-new Alice halts proceedings. How could her and Nick ever split up? How can’t they fix what’s wrong? She vows there and then to fix her marriage – but things aren’t as simple as that. As Alice struggles to adopt her new life, memories start coming – connected to scents and places – and she starts to piece her life back together. Her breakdown of her marriage, the death of her best friend Gina – who Alice didn’t even know before the accident – and the children; recollection starts to filter through, and a charity event to bake the biggest lemon meringue pie sees her experience total recall. When all of her memories come back and she remembers everything her and Nick have been through, will it be too late to save their marriage? 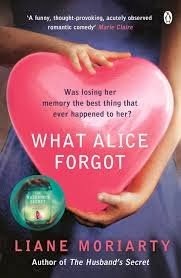 What Alice Forgot is a gripping novel that keeps the reader guessing until the very last page. I like Liane Moriarty’s writing style – I particularly enjoyed The Husband’s Secret – and love this new book. A simultaneously heartbreaking and heartwarming tale, I know I’m going to re-read this many times over years to come.